As usual, the new shows are in italics and shows to be recorded are in color (with green and blue for my two different DVRs). All times are Eastern / Pacific. Central Time would be one hour before the listed time. Here are the previous year's schedules for comparison: 2017, 2016, 2015, 2014, 2013, 2012, 2011, and 2010. Here are the previous year's schedules for comparison: 2016, 2015, 2014, 2013, 2012, 2011, and 2010. Since upgrading to Windows 10 on all my home machines, I have found my computers restarted in the middle of night due to Microsoft's highly aggressive automatic updates. I wasn't able to find a way to do anything except manually delay a reboot. This is bad news for my servers which I do not want restarted randomly and also bad news for my desktop since I often leave work unfinished and work at random hours. 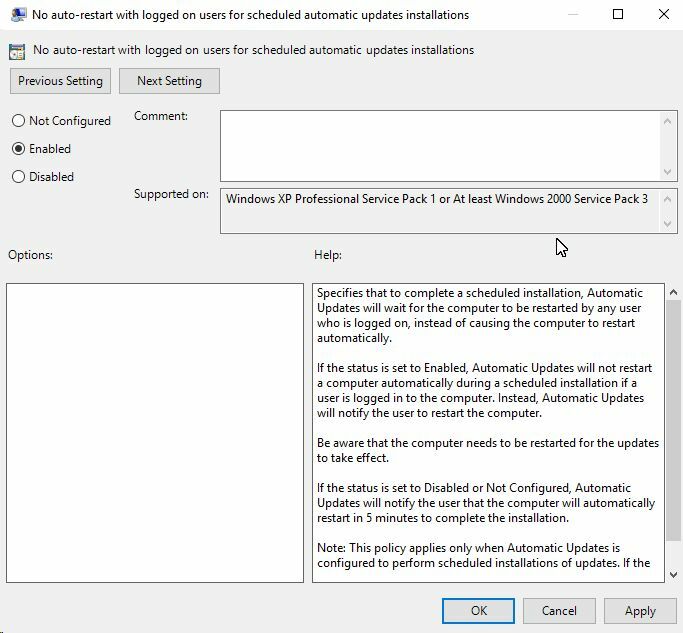 I finally found a setting in the Local Group Policy Editor that appears to be what I need: "No auto-restart with logged on users for scheduled automatic updates installations"
Another year, another TV season to map out. Here is this year's fall television season grid. Here are the previous year's schedules for comparison: 2015, 2014, 2013, 2012, 2011, and 2010. For the last four years, I've published the schedules to the fall television season and which shows I plan on watching. The previous years I've been late at preparing the TV show grid so this year I'm trying to get the grid out before the season begins. Some of the schedule hasn't been finalized by the networks yet, but this should be the current info. I haven't marked the grid for what I'm going to be watching or recording yet because I don't know yet. I'll be doing another post with that update. Like the last couple grids, the new shows are in italics and shows to be recorded are in color (with green and blue for my two different DVRs). All times are Eastern / Pacific. Central Time would be one hour before the listed time. Here are the previous year's schedules for comparison: 2013, 2012, 2011, and 2010. Update August 22, 2014 at 11:50AM: I marked the shows I know I'm definitely recording. Basically, they are the ones I'm currently watching plus a couple new shows I know I'll definitely want to watch (The Flash, Gotham, Agent Carter). I need to find out more about the other new shows to decide if I want to record them. My general strategy is to record the ones that look promising and if the initial reviews are good, then I'll catch up. If they aren't good, then I won't bother to watch the recordings. Update September 1, 2014 at 11:00PM: I added several shows that were missing from the grid and marked some more shows for recording.